That wasn’t flying – THAT was falling with style! After a depressing and busy week at work (lack of posts this week explained) I thought why not to watch a feel-good movie. 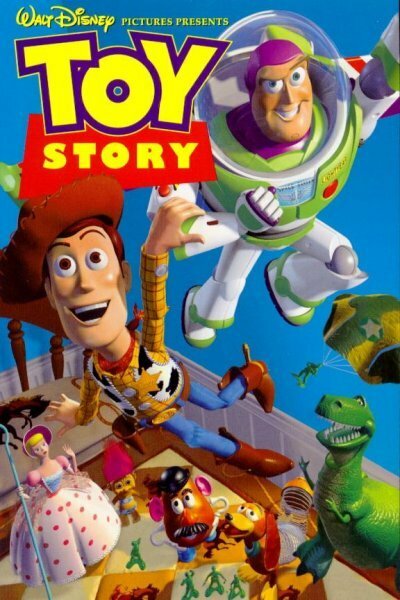 Toy Story (the original one) was produced by Pixar and distributed by Disney. Those Disney movies are all about feeling good at the end after you have learned a valuable lesson. The lesson in Toy Story is the value of friendship and working together. Woody and Buzz don’t get along in the beginning, but thru an unfortunate situation they learn to respect and even like each other. I saw Toy Story back when it first hit the theatres, so now watching it all these years later it felt like a reunion with good old friends. I found myself cheering for Woody and Buzz to break free from that little monster Syd. 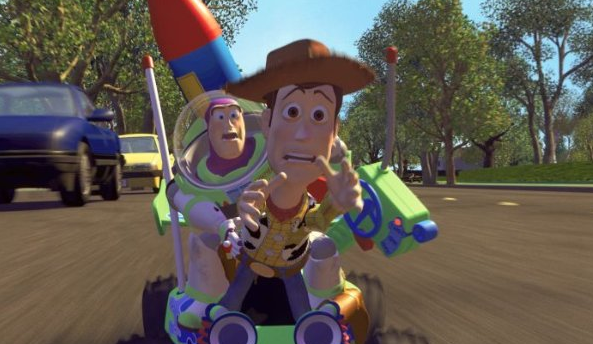 And getting sad when Buzz realizes that he is a toy. Toy Story is about Andy’s favorite toy called Woody (voice of Tom Hanks), who like all the other toys comes alive when humans are not around. Woody has it good – he rules the roost as he has been Andy’s favorite toy for many years. But things change drastically when every toy’s worst nightmare happens – Andy gets a new and more exciting toy as a birthday present – Buzz Lightyear (voice of Tim Allen). 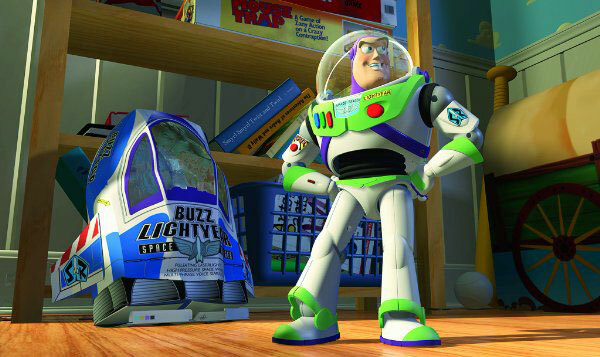 Buzz is a shiny action figure who has all kinds of gadgets that none of the other toys have. He does not realize that he is a toy. He thinks his spaceship crashed and he is here to save the planet. He shortly becomes Andy’s new favorite toy and all the other toys begin to look up to him. Woody is consumed with jealousy and tries to get rid of Buzz. Instead of succeeding in that both of them wind up lost. They now must work together to get back to Andy. John Lasseter who directed Toy Story based Woody and Buzz on his own childhood toys. He went on to direct several other groundbreaking animated films such as A Bug’s Life, Toy Story 2 and Cars. He also received a Special Achievement Oscar in 1995 for his inspired leadership of the Toy Story team. Billy Crystal was originally offered the voiceover role of Buzz Lightyear, but he declined. Boy, did he come to regret that! Tim Allen as Buzz’ voice is perfectly arrogant. Tom Hanks as Woody is excellent. John Lasseter chose him because he thought that Hanks has the ability to take emotions and make them appealing. Woody did not start as a likeable character. The early draft was much darker and Woody looked like a jerk. This was because Disney kept on wanting edgier screenplay. Everybody thought it was really bad (yes, it is bad – it’s one of the bonus features on the Blu-ray released last year) and Pixar went on to make the movie they had set to make in the first place. 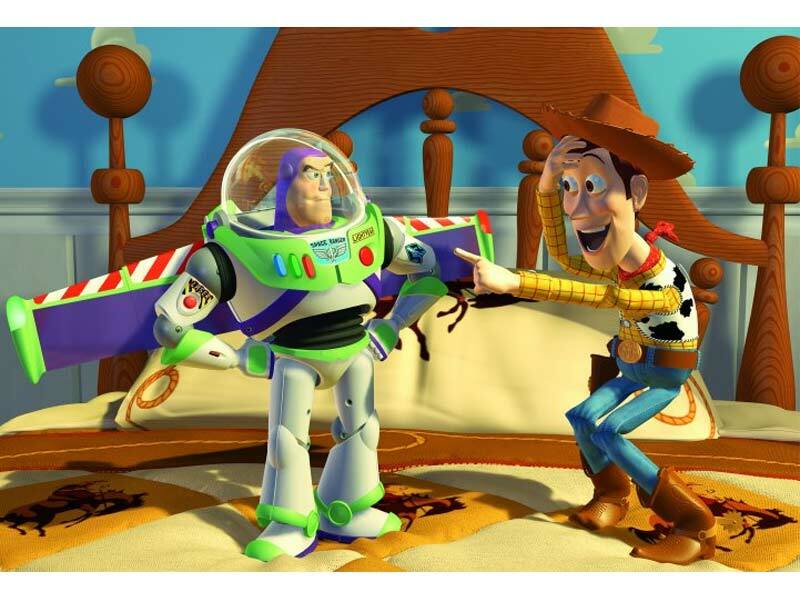 The current Toy Story was born and it is the first animated film in history to be nominated for a Best Screenplay Academy Award – Adapted or Original. I love the scene in the beginning of the movie when the toy soldier army is doing a recon mission to Andy’s birthday party. The animation team perfected the movement of the toy soldiers by gluing some sneakers to a sheet of wood and trying to walk around with them on. Also an interesting fact about the animation – whenever a character’s eyes blink, they never blink together, but one at a time. I thoroughly enjoyed Toy Story way back in 1995 and also yesterday in 2011! I do not own any of the materials featured on this site. Everything is posted purely for entertainment and in appreciation of filmmaking. Please support your local film and television industry by purchasing the movies, seeing them in the cinema or renting them online or at your local video store.